CJ’s mom is eager for CJ to read, and I’m not entirely on board. CJ has to read eventually – I get that – but one of the wonderful things about CJ, or any three-year-old, is that she’s so present and available. By contrast I’m often distracted or absent-minded, and the reason is usually something that I’ve been reading or writing. Literacy and mindfulness clash. This is a big change in attitude for me. Until the internet came along, reading was a sustained, immersive experience, and those of us who were into it could be disdainful of distractions like television or video games. Now reading feels shallow and twitchy, like playing with a remote control. I scan a few sentences, and then click a link or tab to read something that’s only tangentially related. Watching television, by contrast, has become a deep and complex experience, with single episodes that hold my undivided attention for an hour, and long, complex story arcs that unfold over years. Which brings me to the letter G. CJ likes to watch a 2-minute video on my phone at bedtime, and I’ve been steering her to classic Sesame Street songs like “Fuzzy and Blue.” One night she asked her mother for something new, and ended up with “Oh, G (I love that letter),” which teaches both G sounds, and takes her one step closer to becoming one of us literate zombies. 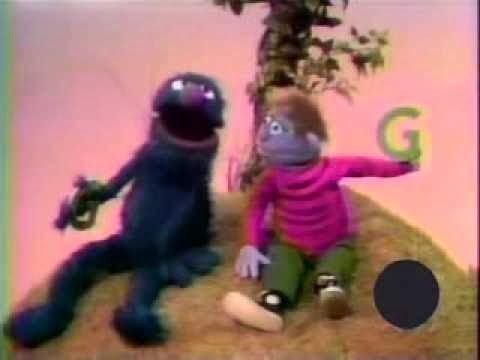 “Oh, G” is very old Sesame Street, which is usually a safe bet, but in this case I think the Sesame Street team was spoofing Lawrence Welk or something, and the result is only tolerable. CJ loves it. Her mother and I are ready for something new. Yesterday at naptime she asked for it again. When I searched for it, Youtube brought up a number of similar videos, including the one where Grover and George sing a hilltop duet about the first letter in both their names. It’s a song that I last heard watching a black-and-white television in the 1970s. “G Grover” is a lovely song, about on a par with “Inchworm” — gentle and affectionate, perfect for putting a child to sleep.